There are some basic tools you should always have ready – such as: a pair of small tongs (and a wire cutter), a putty knife, a caliper for precise measurements, a pair of tweezers for whenever your fingers are too big, a sharp precision cutter and/or scalpel (X-acto), an old toothbrush for cleaning purposes, brushes in different sizes for hand painting. Also always useful: Scissors, different screwdrivers, a pencil to mark dimensions, a ruler (preferably equipped with a metal edge), a protractor, a calculator to compute mixing ratios, differently sized saws and a water level. 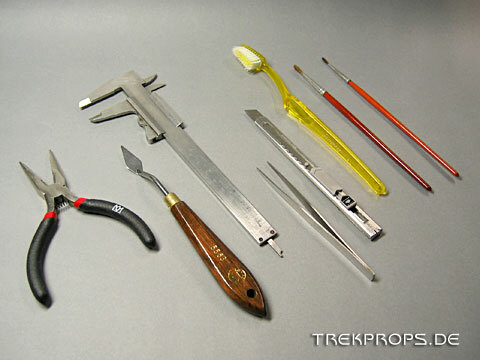 Tags: Brush, Caliper, Precision Cutter, Putty Knife, Tongs, Tweezers.